After a huge gap from Paradesi , Bala is back with his film ” Tharai Thappattai ” it was released as a pongal treat. The film got A certificate from the Censor Board and this increased the curiosity over the film. This A certificate was mainly due to the violence and the dialogues used. The story is set against the backdrop of the life of folk dancers and their difficult livelihoods. Every Bala film has a detailed Characterization compared to other film makers . 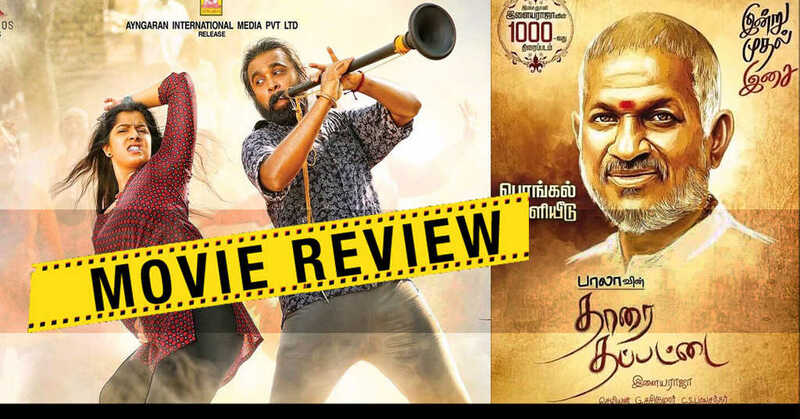 In this film Thaarai thappattai has given us ‘sooravali’ brilliantly enacted by varalakshmi who outshines every other actors in every frame.This film also happens to be Ilaiyaraaja’s 1000th film and the audio of the film was launched in a grand manner. Varu and Saikumar and dancers and they loved each other . Varu was deeply in love with sasi but sasi sacrificed his love so that Varu gets married to a govt Employee . Then when Sasi finds out that the life of Varu went miserable , the rest is story . Varu has emotted very well and gets a huge applaud for all the emotional scenes mixed with dances . She is the biggest asset of the film followed by the Legend himself ” Raja ” sir . The BGM is classic and is a part of the film. Thappattai may live up to the expectations of Bala’s brand of cinema lovers and loyal fans. However, Tharai Thappattai will not be everybody’s cup of tea. VERDICT : Perfect Movie for Reality movie lovers .